Make a quilted nine patch wall-hanging with 9 wool felt hand embroidered ornaments. Perfect for Christmas or any time of year. This project is on the cover of the book. This can be presented as an Introduction to quilting class - the quilted nine patch is simple to make and shows new students simple piecing techniques including how to read a pattern, how to cut your fabric, piecing and sashing. Students also could learn to machine quilt this small project and how to do binding. Though perfect as an intro class, this would certainly be appropriate for experienced quilters. Additionally, there is a part two to this class - an Introduction to Wool Applique. 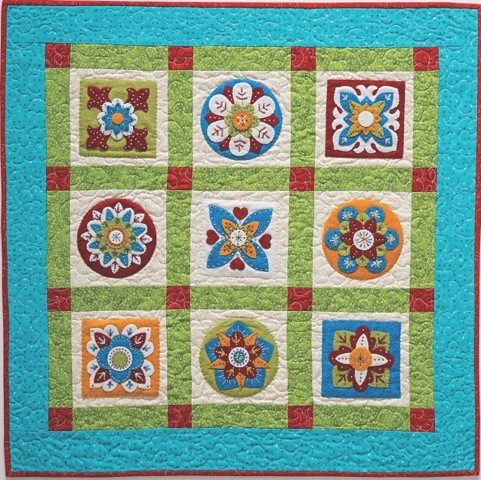 The nine embroidered wool felt ornaments are used to adorn the quilted wall hanging. The next time you meet would be to introduce the wool applique part of the series. The first class in wool applique would focus on how to transfer the pattern and how to do the five easy embroidery stitches. Once the students have these skills they can either work on their own or it would be more fun to have a series of stitching meetings. The shop could encourage students to return to stitch together by providing kits and templates printed onto freezer paper sheets (available from C&T). This is a nice time for students to get together and work on their project and it also gets students to return to the shop. Each ornament takes about 4 hours to finish. This would need to be presented as a series of classes. The quilting class would be either one long day class or two shorter classes. Each ornament class/stitch group would be at least 4 hours. For the quilting portion, students would need a sewing machine, common cutting and pressing areas are needed. 1. How to read a pattern. 2. How to cut fabric to the appropriate sizes. 3. Simple piecing including using sashing. 4. How to add borders. 5. How to machine quilt. 6. How to bind the project. 1. Transfer the templates to the wool felt, the easiest way to do this is to use printer friendly Freezer Paper Sheets (available from C&T Publishing). 2. How to make the five common embroidery stitches needed for this project. It is best to have students try the stitches first on a scrap piece of wool felt. 3. Follow the step-by-step instructions to make the nine ornament pieces.